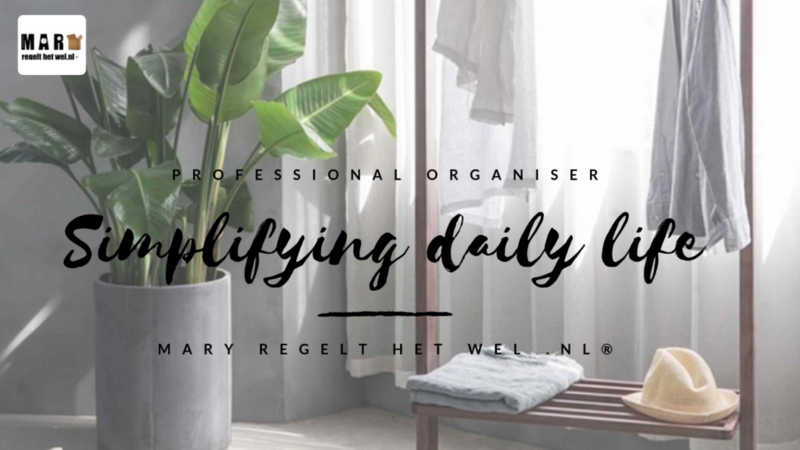 MARY regelt het wel .nl® can assist you in simplifying your daily life as Dutch professional organiser. Combining a busy job with family, a house hold, hobbies and a social life can be challenging. If your daily routine wears you out, please feel free to contact me. Together we will make room for what matters to you most. We will reduce clutter and stress, create focus, save money and provide fulfilment. I can also coordinate a relocation or take care of the paperwork after the demise of a loved one. During our first call, we will schedule a free 45 minute introductory meeting. During this meeting, we discuss your challenges and wishes. Based on that, I will explain how I can assist you and how much it will cost. If we decide to work together, I will prepare a simple action plan. We will then schedule a follow-up appointment to get started together. I will assist you in taking decisions, encourage you and will teach you simple techniques that you can use immediately. You will be amazed of how much we can achieve in a short time. The best time for new beginnings is now, so please contact me for more information.